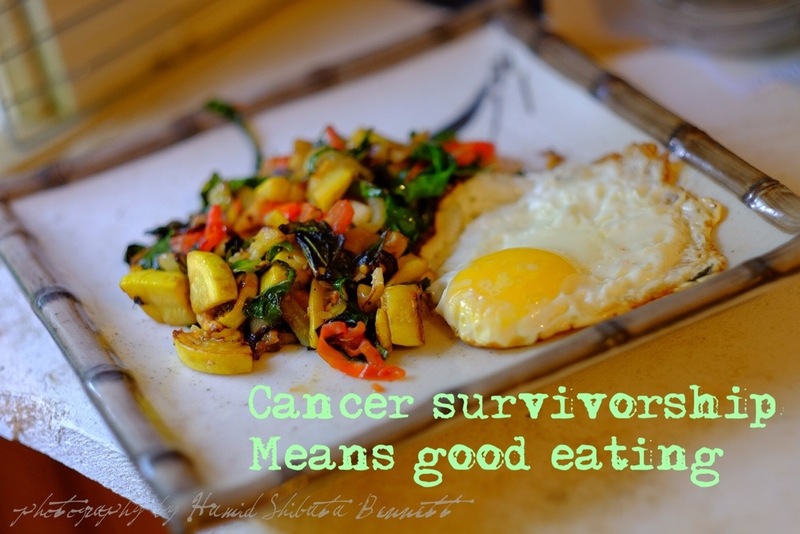 Cancer survivorship truly means good eating. These days, I tend to eat less grain, less gluten, less sugar. I feed my body with good quality protein and more and more vegetables. I primarily buy organic and prefer local produce whenever possible. I take every opportunity to improvise in the kitchen. What ingredients are in the fridge? This morning, I pulled out some baby bok choy, yellow squash, garlic, kale, a wee tomato and an egg. Here’s my Sunday morning foodie adventure, snapped with the Fujifilm X-T1 and 56mm, f/1.2 lens. 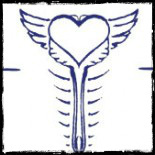 From my kitchen to yours… Enjoy! I began my improvised breakfast adventure by heating up the ten inch cast iron skillet on medium high. I added a generous dollop of duck fat. Duck fat adds such wonderful flavor! I tore off three baby bok choy leaves and sliced them up. As the duck fat heated up and began to crackle, I turned the heat down to medium low and added the baby bok choy. 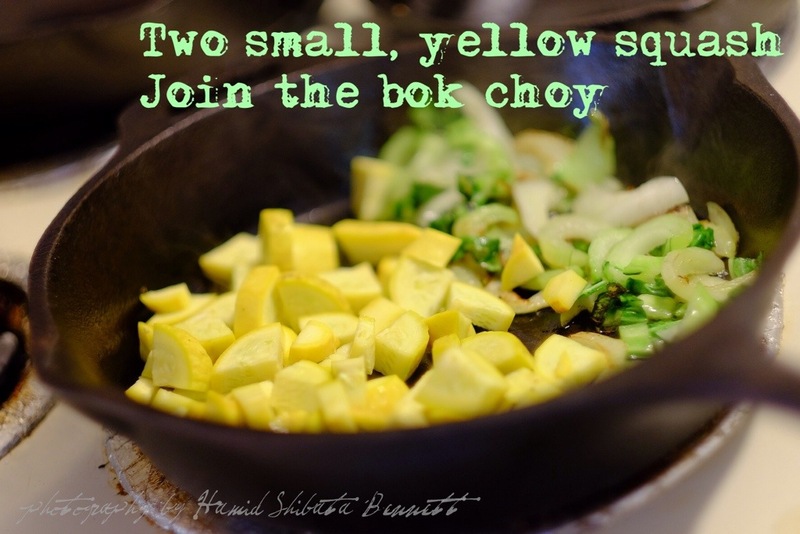 I had a couple small, yellow squash in the fridge, so I chopped those up and added them to the skillet, next to the baby bok choy. 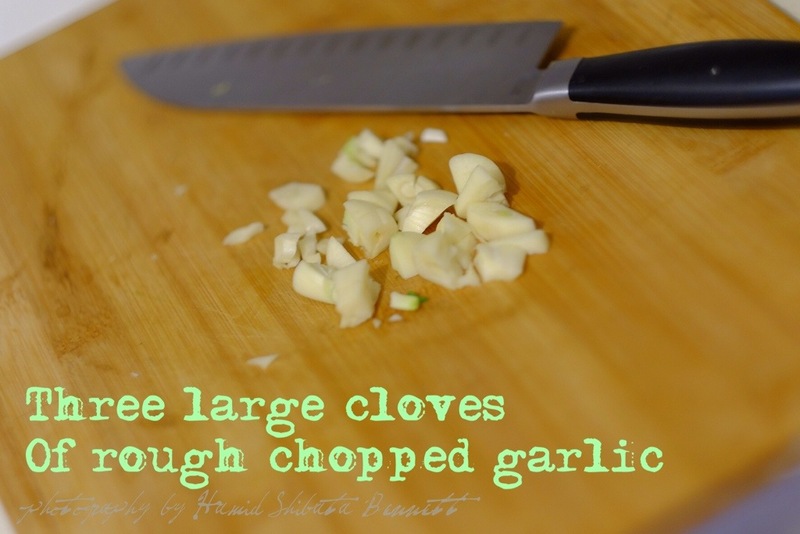 Next came three large cloves of garlic, roughly chopped. I added in the garlic. The duck fat is beginning to caramelize the vegetables. 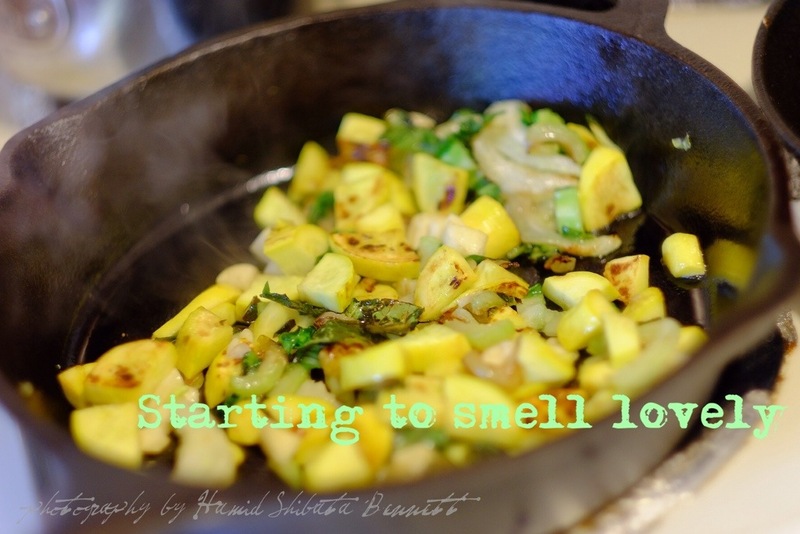 It’s starting to smell lovely in the kitchen! What else is in the fridge? I found a wee heirloom tomato and some kale. 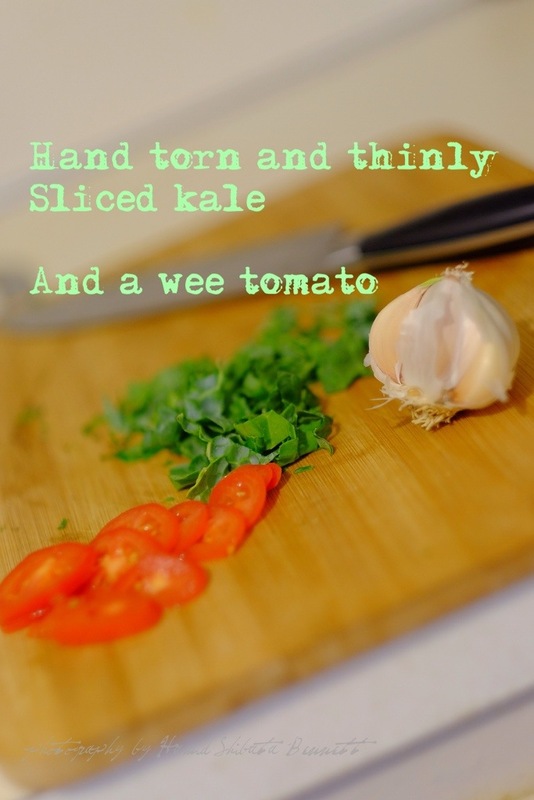 I hand tore the kale off the stalks and thinly sliced the leaves. 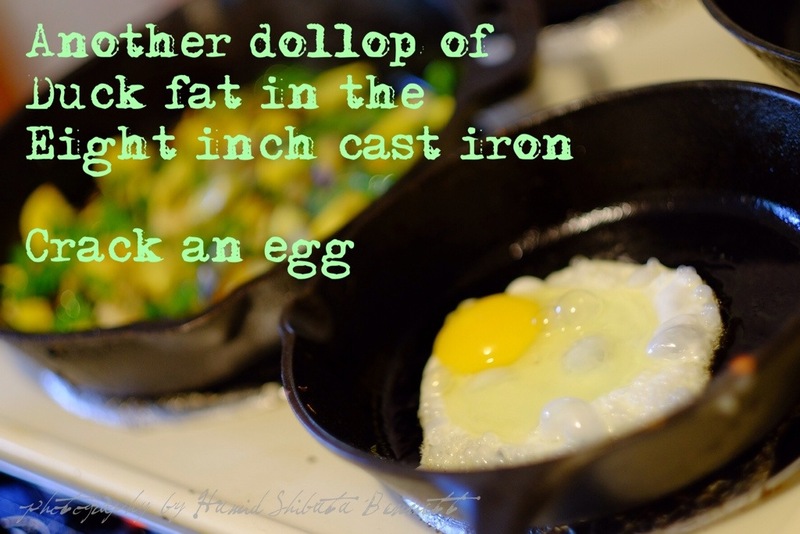 A dollop of duck fat went into the eight inch cast iron skillet. Once the cast iron was hot, I cracked an egg in the pan. First of Nine Top Tip: Cast iron’s non-stick qualities are enhanced by lower cooking temperatures and a generous bit of good fat in the pan. This was breakfast and it was delicious! Such a nice way to spend a quiet morning. Have you improvised something delicious and nutritious in your kitchen recently? Share your culinary success and leave a comment! • What if I had time? 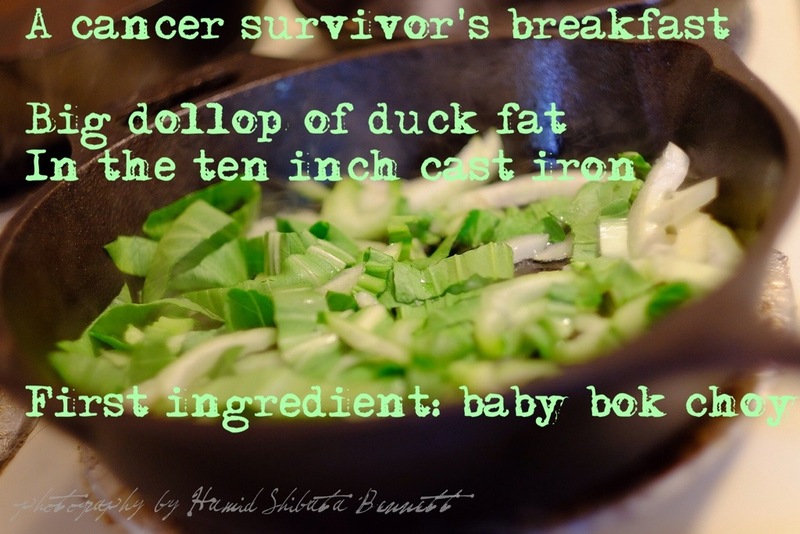 This entry was posted on September 14, 2014 by Hamid Shibata Bennett, LMT, CAMT in Good Eats and tagged baby bok choy, cancer, cast iron, cooking, Duck fat, eating, fujifilm, garlic, healthy, kale, recipe, squash, survivorship, tomato, x-t1.